The Sector Response Unit (SRU) and Police Emergency Toll Free number would effectively work in Madang town to curb the growing law and order issues. Police presence would be maintained in hotspot areas during peak periods and odd hours. Police can be reliably reached during emergency on a toll free number funded by the Madang Chamber of Commerce and Industry. Madang only needs a innovative police commander to take charge of the force and deliver peaceful and safer environment for the public and businesses to thrive. DID ANTHONY WAGAMBIE DID WELL DURING HIS TERM AS PPC MADANG? Yes, of course there was partnership and cohesiveness between police, the public and business houses. Companies were employing youths from the area they are located at. This minimizes crime and provided a source of income for people doing nothing and causing problems in the communities. Wagambie in a television documentary produced by Scott Waide also highlighted the need to provide proper housing for police officers and their families. The police-housing problem has been a long-standing issue that has been overlooked by successive governments. Wagambie proposed the SRU concept to be introduced in Madang but didn’t eventuate because of funding constraints. 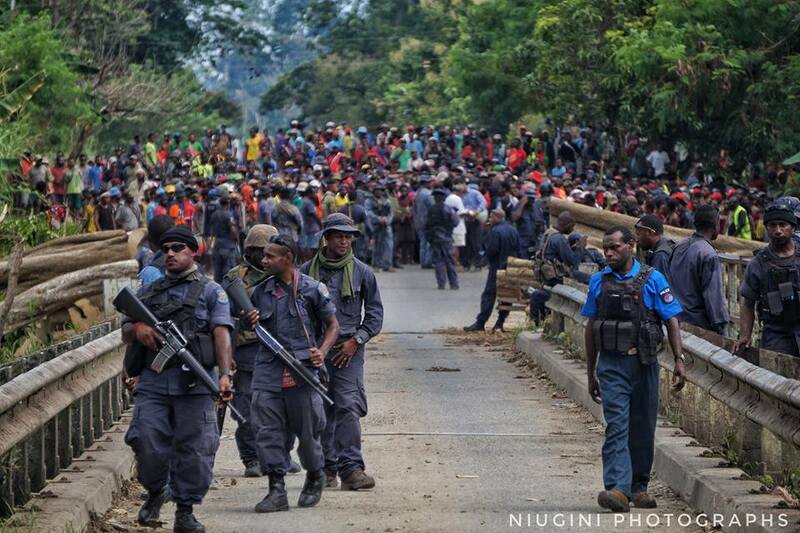 Today the SRU concept is the most effective in Lae under Wagambie’s leadership with a police response time of less than 10minutes to attend to reports. WHAT DO WE NEED IN MADANG TO BOOST POLICE OPERATIONS? From Lae’s experience, it is important that first and foremost every Madang MPs put their resources and funding together to build proper police stations and houses to accommodate police officers. Madang town should at least have five SRU units to patrol certain designated areas in the town, up to Newtown, Airport, Sisiak, Sagalau right up the North Coast road to Sek and Alexishafen. One or two units can also patrol towards Balasigo up to Gum and 4mile market. Five fully kitted landcrusiers would cost around K1million alone from Madang district. If the other five districts contribute a vehicle each, there should be around 10 SRU vehicles to cover the length and breadth of the provincial capital- Madang town. Madang town wont need additional Mobile Sqaud units if they can have an elite team already in the SRU unit like Lae. There are 10 more settlements in Lae than in Madang and people from different cultures and provinces dominate these communities. You wont find a settlement made up of only Chimbu’s and Southern Highlanders; there are Sepiks and Engan’s also living among them. There are still so many problems arising from these communities, but police have always been on time to disperse troublemakers and prevent problems from escalating. Forced eviction has been an option for settlements in Lae, however the government has failed to repatriate thousands of people from previous evictions. If the government evicts them here, then their people might evict Morobeans in their province and so the problem wont be solved. However there are stringent measures and structures in place, where community leaders are tasked to maintained communication with the police and political leaders and be responsible for law and order issues in their respective communities. When a problem occurs, the leaders point out the troublemakers and they are handed over directly to the police to be dealt with. The troublemakers are then demanded to move out from the community. If they resist, they are forcefully evicted. There are structures in place for community leaders to maintain control over their people. Reserved police officers come into the picture in communities only to assist in sorting out commotions and making sure domestic problems don’t escalate out of the community. The police and the members of the public should all work together to keep the community safe for everyone. We cannot expect the police to solve all our problems. We have to responsible starting with our own children and family members. Business houses should work together through the Madang Chamber of Commerce and political leaders, Churches, NGOs and other stakeholders to create a peaceful environment for everyone. The town council should have it’s own policing unit to ensure that there is no street vending, selling of betel-nuts on the street and most importantly littering at public places. Clean up your residential areas. A clean environment can change the mindset of the commuters to act responsibly. When Madang has it’s own toll free number, then it can be prominently displayed on police vehicles, market places, stores or billboards so that the public can have access to police on time. All police face similar problems countrywide, but it's good management that will cost little and serve our people diligently.